When Michael and I started Preservation Wood Sales, we didn’t know that much about reclaimed wood. But we were passionate about it anyway and saw a way to bring our experience in supply chain custom manufacturing to a new industry. We partnered with St Pierre Woodworking, where Michael works as a lead craftsman to this day, to find new sales outlets for St Pierre’s reclaimed wood products–and dove right in. Two years later, our knowledge has deepened and our business model has changed a lot: We’ve developed our own product line of reclaimed wood and salvaged wood floating shelves. We create mantels using both St Pierre’s and our own reclaimed wood inventory. We sell our mantels and shelves primarily on Etsy, and have moved away from custom work. Michael’s full-time job made custom work too challenging to juggle with his work schedule. We love our niche! Meanwhile, we found ourselves taking on small local construction projects, and lending a hand when my brother, Stefan, needed help with remodeling projects (see Stefan Morikawa, LLC). Michael’s metal shop has seen regular use–for metal table bases, hand-forged steel corbels, a flatbed trailer frame or as the scene for Stefan’s latest (crazy) metal sculpture! Finally, we decided it was time for a new name for our business, and a new look to reflect our ethos. In February 2017, we launched The Workshop | Floyd, VA. The founding values that inspired our work with reclaimed wood still drive us: forest preservation, fine wood, and quality handwork. But we’ve embraced the spirit of collaboration with our co-conspirators we’ve so enjoyed, and broadened our business model to include metalwork and small scale local construction and repair projects. We look forward to the future with curiosity and hope for what this next phase will bring. Hammering a hand-forged scroll into shape. Heating an angle bracket in the forge. Taking a break to evaluate the hammered end of this angled bracket. Katy on the case, skimming drywall for Stefan Morikawa, LLC. Michael hand cuts steel sheet with the torch for a recent project: The Bottom of the Stairs (photos coming soon). Michael and his neice, Lily, in the shop. Michael and Katy’s nephew Bodhi drive the excavator. Bodhi is obsessed with construction equipment. Stefan heating and bending steel rod for a recent project. A jig for gluing cuttingboards. The Old Place in Nantahala, North Carolina, Katy’s family retreat since the 1960’s. 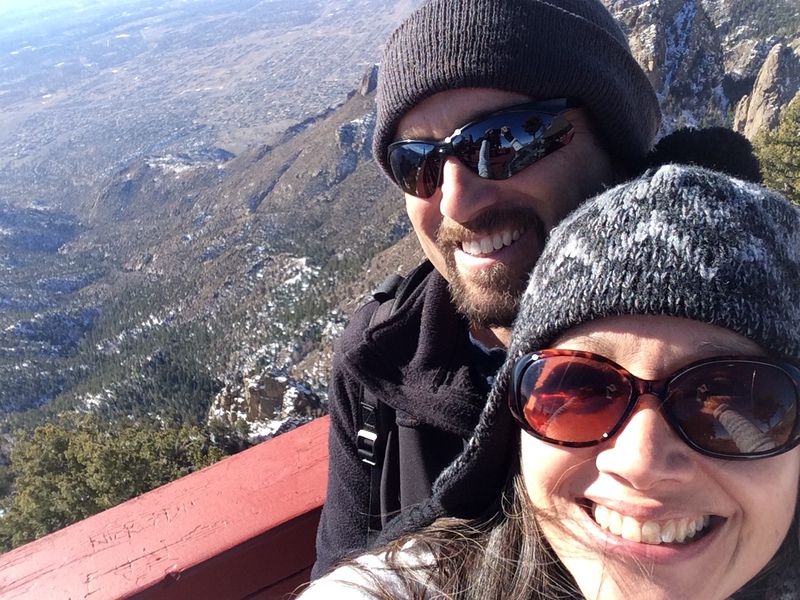 Michael and Katy looking uncharacteristically glamorous in the sky tram up to Sandia Peak in New Mexico.